As a busy mom of two young children, I know how important it is to spend quality time with them. I also know that it can also be difficult and challenging. That's why I love cooking, baking and spending time in the kitchen with my children. 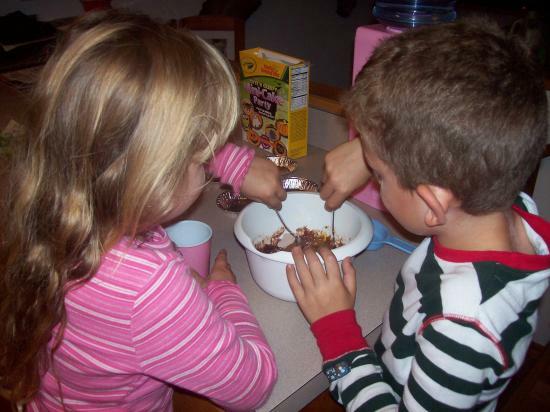 It all started when they were old enough to safely sit on the kitchen counter and help me stir and measure. 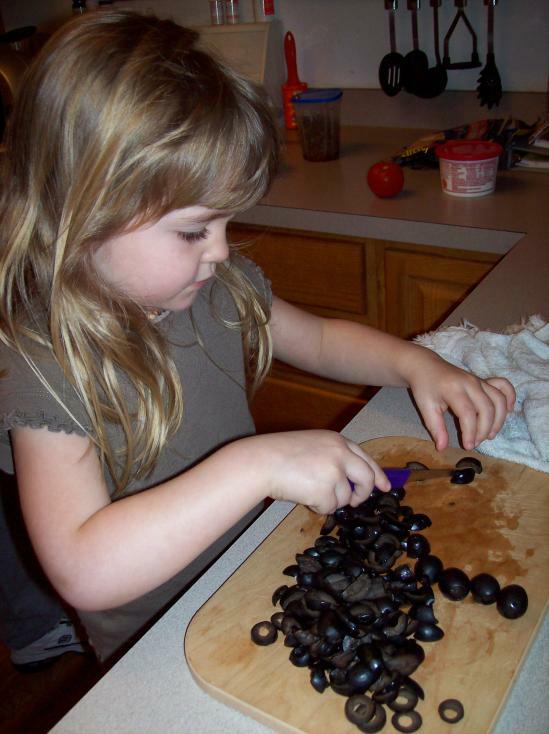 It's important to teach your children how to cook and to have a love for healthy foods at a very young age. My children are 8 and 11 and will eat anything, well almost anything. My daughter loves raw spinach in salad but she hates cooked spinach. My son hates raw cauliflower but he loves it steamed! Funny how that works. 1) VEGGIES! My children aren't picky eaters but I know many children are. Shredded veggies can be hidden and added to anything from spaghetti to hamburger patties. Trust me, your children, and even your husband, will have no idea they are there. 2) APPLESAUCE! Instead of adding oil and butter into your cake and brownie mixes, add applesauce instead. It leaves them super moist and delicious with fewer fat and calories. It's also great on sandwiches, my children love peanut butter and applesauce sandwiches! 3) MAKE IT FUN! Create a funny face with fruit slices and dip. Use cookie cutters to create fun shapes for bite-sized sandwiches, meat and cheese. 4) CHOICES! Always let your child have a choice. I ask my children every single day, every meal... "would you like this or this?" By giving them the choice, they feel like they are in control and that their opinion matters. Even though they are choosing between two healthy options, they still get a vote. I honestly think that my children are such great eaters because they have always been involved with preparing their meals. From the kitchen to the dinner table, cooking food together with your children is a great way to bond and create memories that will last a lifetime! Do you have children between the ages of 5 and 12? If so, Uncle Ben's is looking for you! Get your FREE Sample of Purex Triple Action today! **Please note, that the FreeSamplePurex.com promotion only allows one Purex sample per household per year, so if you choose to sign up for the liquid sample now, you will not be eligible to sign up for the UltraPacks sample once it is available in a few weeks. POPCORN! There isn't a night that goes by in our house that the kids don't ask for popcorn. We love popcorn for snack, dessert and of course when we watch movies! A movie just isn't complete without a big bowl of popcorn! 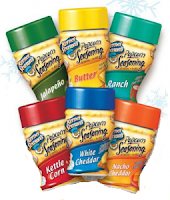 I want to thank everyone who entered my Kernel Season's Popcorn Seasoning Giveaway. I would also like to thank the giveaway sponsor for providing this great giveaway for my readers. Do you realize that there is less than 48 hours left in January! Where did the month go?! Don't miss your chance to print and redeem these valuable money saving coupons before they expire! There are some coupons that are perfect for your Superbowl party snacks! My daughter is a commercial junkie, she can sing the tunes and jingles to just about all of them. As soon as my daughter saw the commercial for Wuggle Pets, she begged for me to buy her some. In a matter of seconds she was hooked, pointing out her favorite and telling me in which order she wanted to buy them! That's right! She didn't want just one or two, she wants them all! Wuggle Pets are the cute and adorable stuffed animals that kids bring to life themselves. They get to stuff them, add magic dust and even give them their own unique personality. Plus, each adorable Wuggle comes with its very own birth certificate so you can name it yourself. When our Wuggle Pets starter kit arrived, my daughter could hardly contain herself. She was so excited that she couldn't wait to get started, she had to open the box and get started immediately! She chose to bring the magical unicorn to life first. As she was filling Mystic the magical unicorn with stuffing, she let go for a moment and it went flying across the room. We were all laughing so hard that tears were flowing down our faces. After that, I held onto the Wuggles while she twisted and filled! In just a few simple steps and in no time at all, my daughter created a new best friend. It's as easy as... 1, 2, 3! Stuff, Sprinkle, Zip - it's as easy as that! I love that it's easy enough that she can do it herself and it's something that's fun! The zipper tool is genius, it zips it up and keeps it up, so little fingers can't unzip it and pull out the stuffing. I've had a wonderful weekend with my family and am looking forward to a great week. We have a wrestling tournament, basketball game and gymnastics to attend. Plus, there is no school on Friday and I'm looking forward to a three day weekend! Hi there! I hope you are all doing well. I just wanted to let you all know that there are several giveaways happening on my blog right now. Some of them have very low entries and one of them has NO entries. The giveaway with NO ENTRIES is rather surprising to me as it's a $100 Amazon.com Gift Card Giveaway. Come on over and enter for your chance to win some great items! Whether you own a business, publish a blog, provide a service or have a special event coming up, chances are that you have a need for promotional items. Maybe you're just starting out, a new business needs customers to survive. You might be a well-established company that wants to thank its loyal customers and employees or encourage new ones. It's amazing how big of a difference a little promoting can make for for a company. Often times the key to success is as simple as getting the word out about. Word-of-mouth, advertising, business cards and promotional products are just a few simple ways to spread the word. Branders.com offers a wide variety of great promotional items from water bottles and funfliers to t-shirts and keychains. 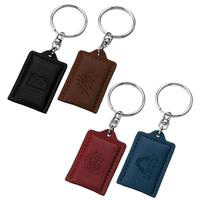 Promotional keychains are the perfect item to encourage greater support from customers, clients, and even employees. With 80 styles to choose from and prices starting as low as $0.34 each! Broadway’s longest-running production of all time celebrates a triumphant quarter century on stage with The Phantom of the Opera at the Royal Albert Hall, coming to Blu-ray – with perfect hi-def picture and perfect hi-def sound – DVD, On Demand and Digital Download on February 7, 2012 from Universal Studios Home Entertainment. On October 2, 2011, composer Andrew Lloyd Webber and producer Cameron Mackintosh marked the 25th anniversary of their beloved musical extravaganza, “The Phantom of the Opera,” with a lavishly staged production at London’s legendary Royal Albert Hall that was beamed live via satellite to cinemas across the globe. The Phantom of the Opera at the Royal Albert Hall marks the first time a live performance of the blockbuster musical has been made available for home viewing, making it a must-have anniversary release for fans everywhere. The Phantom of the Opera at the Royal Albert Hall stars Ramin Karimloo (2011 Olivier Award nominee for Best Actor in a Musical for “Love Never Dies”) as the lovestruck Phantom and Sierra Boggess (2011 Olivier Award nominee for Best Actress in a Musical for “Love Never Dies”) as the beautiful and gifted soprano Christine. The show also features Barry James, Gareth Snook, Liz Robertson and Wynne Evans, as well as special guest appearances from the actors who originated the roles of The Phantom and Christine, Tony® Award winner Michael Crawford and Sarah Brightman, in a memorable final curtain call. 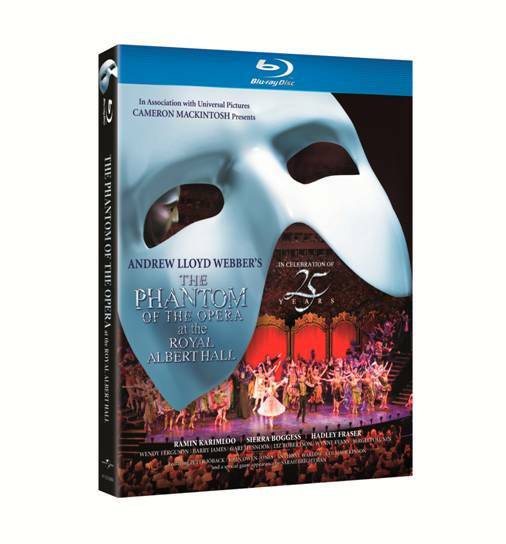 “Phantom” aficionados will also be thrilled to know that “Love Never Dies,” Andrew Lloyd Webber’s spectacular follow-up musical will also arrive on Blu-ray and DVD for the first time on May 29. With lush visuals and a mesmerizing score that rivals the original in power and beauty, this live production of “Love Never Dies” finds Christine and the Phantom reunited in turn-of-the-century New York City after a decade apart. Take This Once-in-a-Lifetime Experience Home and Win a DVD! On September 8, 2010, my friend and I joined Curves together. We both wanted to lose some weight, but more importantly get fit. We are both pretty active but we just needed something more in our daily routine. Afterall, we aren't getting any younger. Our original goal was to go 3x a week. Well, we have been going 4x a week and we are having a blast. It's something we actually look forward to doing each morning. I drop the kids off at school and head straight to workout. In the first month of my Curves membership, I lost 5 pounds, 4 inches and 1.3% body fat. This year, be the star in your own Success Story. Every day, women who thought they couldn't get fit find out that they can at Curves. Burn up to 500 calories with our 30-minute workout, which combines strength training and cardio for a workout that works your entire body, from head to toe. It works every major muscle group and gives you results that last. Now's the time to take the first step toward YOUR success. Join Curves today and get started today for only $10. Are you ready to start working out and getting into shape for summer? Jockey sports bra has moisture wicking technology to keep you dry and your body cool while you workout...and Purex Crystals fabric softener keeps that special technology working. 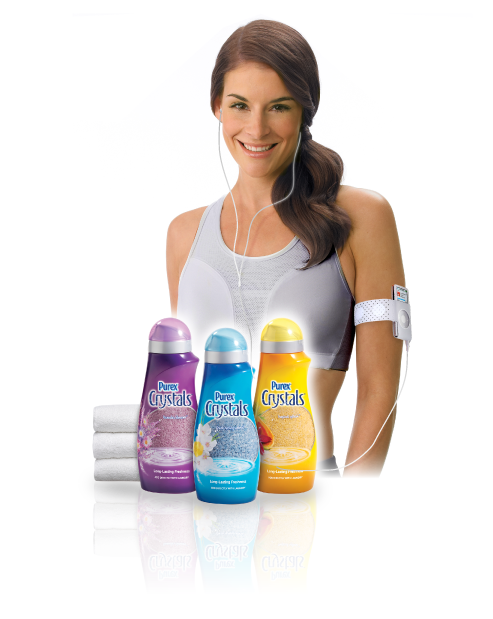 Purex Crystals is an innovative freshening product that doesn't use oils for softening (found in liquid fabric softeners), so it can be used on all laundry, including sports bras. Would you like to promote your business or your blog? Have a party or special event coming up soon? Maybe you have that perfect family photo, photo of your child or possibly a photo of your pet. Don't miss your chance to WIN an 18” x 24” Poster Print that you get to personalize and customize to your liking! UPrinting makes online poster printing a breeze. Not only do they have cheap poster printing, they also have different poster printing services to offer. You can make your own poster for free using their online Easy Design Tool. They also have free poster templates you could use to set up your file correctly. Plus, you can download and use a free poster template online by just signing in. I've had the pleasure of receiving a few different customized products from UPrinting and I have had great experiences. Their print quality, customer service and shipping turn-around time is excellent! I'm thrilled to announce the “Picture Perfect Pie” photo contest. Do you love pie? Do you have a favorite or do you love pie equally? I'll admit that I don't eat pie on a regular basis, but cheesecake is my absolute favorites, although I'm not sure it's technically a pie. My kids love chocolate cream pie and my husband's favorites are coconut and banana cream! Appliances Online is the UK's Largest Online Kitchen Appliance Retailer, from refrigerators and freezers, to dishwashers and ovens to washing machines and dryers. 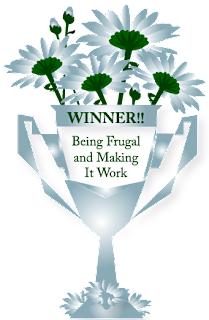 They love to spread joy and happiness, and they’re offering a very fun contest just for Being Frugal and Making it Work readers. By entering a photo of your picture perfect pie, you could win a $100 Amazon Gift Card! I can hardly wait to see all the delicious and mouth-watering desserts! Have you ever gotten paid $100 to bake a pie before? 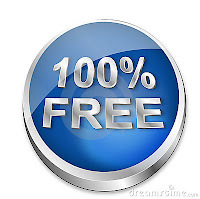 Do you love getting things for free? Are you a Facebook member? Hurry on over and "like" Astor & Black to get a great freebie! Just by liking them you'll get a free vintage tshirt! I'm in and my husband will be getting a new shirt! HURRY, this great freebie won't last long. Supplies are limited and valid in both the US and Canada! When I first started my blog I didn't think it was going to be as big as it is now. It's amazing at how much a little promoting can do for you. Sometimes the key to success is as simple as getting the word out about your product, business or service. Word-of-mouth, advertising, business cards and promotional products are just a few simple ways to spread the word. Whether you own a business, publish a blog, provide a service or have a special event coming up, chances are that you have a need for promotional items. You don't have to spend a lot of money to make your business work for you. Promotional pens are less than $1, starting as low as $0.49 and are available in a variety of styles and colors. These are the perfect way to "write" your name across town! Promopeddler.com offers a wide variety of great promotional items from pens and notepads to tumblers and apparel. You can customize their items with a personal message or even your business logo. When you order you get your very own personal account manager, making the ordering process quick and easy. I live in a snow belt so winter driving comes with the territory. I'm not afraid to drive on snow or ice packed roads, but I do drive differently. I'm always nervous about what the other drivers on the road might do, so many reckless winter drivers, that don't stop to think before they get behind the wheel. BE PREPARED: Make sure to keep emergency supplies in your vehicle at all times. Jackets, blankets, flashlight, jumper cables, snacks, water and a first aid kit are among the most important! Hopefully you will never have to use them but if you do, you'll be happy they are available. 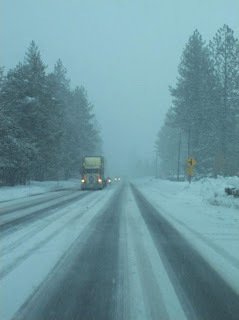 ALLOW EXTRA TIME: When roads are slick and snow covered it's always best to stay home whenever possible. However, if you must go somewhere give yourself an extra 15 to 30 minutes to get there. It's always better to to be early (or late) than to get into an accident along the way. FILL UP: During the winter months it's especially important to keep your gas tank full. You might get stuck and being able to keep your vehicle running is going to keep you warm. PAY ATTENTION: When you are the driver of a vehicle you are responsible for every other person inside that vehicle as well. Don't let distractions inside the vehicle take your attention away from what's going on outside the vehicle. DRIVE DEFENSIVELY: Be aware of other drivers on the road. Just because you see them doesn't mean that they see you. Being alert could serve as a very important tool for both you and the other driver. HEADLIGHTS: Keep your headlights on, it helps oncoming vehicles see you! Driving is a wonderful thing and it shouldn't be taken lightly. The choices you make when behind the wheel of a vehicle not only affect you but everyone else around you. Be safe, drive carefully and enjoy where the road takes you. 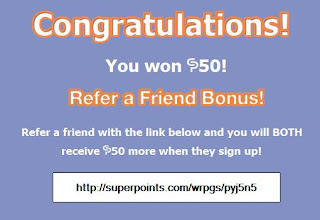 50 Superpoints Bonus Invitation - Win Money & Have Fun! If you have been considering signing up for Superpoints, but have not already done so you can take advantage of this great Superpoints bonus point invitation and get 50 BONUS POINTS just by signing up at Superpoints! I hope to see you at Superpoints! Just think of all the fun you'll have! Do you love popcorn as much as my family? We love popcorn for snack, dessert and of course when we watch movies! A movie just isn't complete without a big bowl of popcorn! Did you know that Americans consumed over 16 billion quarts of popcorn last year? I love popcorn because it's quick and easy, low in calories and it tastes great! We can also easily spice things up by sprinkling some popcorn seasoning into our bowl! More and more people are needing fashionable and affordable eyeglasses. I had my first experience purchasing eyeglasses a couple years ago and I'll admit that it was a little bit overwhelming. So many choices, colors, designs and options, I honestly didn't know where to begin. GlassesUSA cuts out the middle man and offers cheap eyeglasses that are durable, comfortable and stylish. Affordable and fashionable equals the perfect combination. They offer a 110% lowest price guarantee and a 100% satisfaction guarantee along with a generous refer-a-friend program. It doesn't get much better than that. You can get a pair of prescription glasses starting at just $38 including lenses. There are hundreds of frames to choose from making it easy to express your personality style. Whether you're looking for a sophisticated look for work or a flirty pair for going out. For those people who have hectic schedules or those who don't like to switch from reading glasses to distance vision eyeglasses, multifocal glasses are the perfect choice. They are the perfect all-in-one time saver. At GlassesUSA.com you can buy a great pair of eyeglasses without breaking the bank! Unlikely Friends - How Will You Find Out Who Your Friends Are? Sometime we find friends when we least expect it, and sometimes the best things in life present themselves when you're not looking! That's why we should always keep our minds and our hearts open. 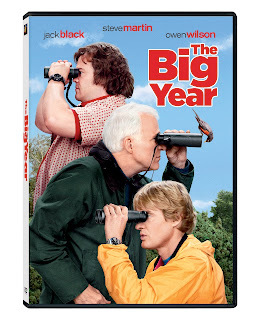 Bird loving duo Brad and Stu become instant, yet unlikely, friends on their quest to top the spot in The Big Year annual event. Here, we'll list the top films in which a couple of opposites become unlikely friends including Tim Robbins and Morgan Freeman in The Shawshank Redemption, Jack Nicholson and Greg Kinnear in As Good as it Gets and “Chunk" and "Sloth" from The Goonies. In the classic film The Goonies, Chunk and Sloth are literally forced together in a sort of mutual punishment by the demented Fratellis. 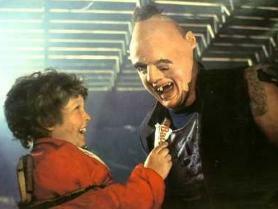 Initially enemies, Chunk and Sloth quickly become friends over a mutual love of the candy bar Baby Ruth. The horribly deformed Sloth and the funny child Chunk are certainly a strange pair, but they band together to save The Goonies and become unlikely heroes. 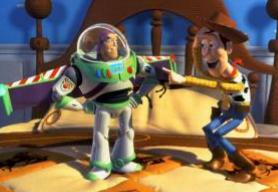 In Toy Story, the film that revolutionized both CG animation and children’s films, old cowboy Woody is at odds with the shiny, new space range Buzz Lightyear. Because of Buzz’s delusions that he is an actual space ranger (and not a toy), and the fact that their owner is giving him preference over Woody, Woody plots against Buzz. Following a series of mishaps, Buzz and Woody are forced to work together to escape and return to their owner and, along the way, they become lifelong friends. With Valentine's Day right around the corner, chocolates are always a perfect gift for that special someone in your life. Chocolate roses, lips and hearts make the perfect Valentine's Day gift ideas! I recently had the pleasure of trying a few different Valentine's Day chocolates from The Madelaine Chocolate Company. They are as cute as they are delicious and melt in your mouth. You can choose chocolates for just about every season, holiday, sport and more. Chocolate Bunnies and Ducks for Easter, Sweetheart Roses for your Valentine, Assorted Roses for Mother's Day and the list goes on. I received the following items for review and one lucky reader will win the same items just in time for Valentine's Day! Their lavender sweetheart roses are solid premium milk chocolate rose buds, wrapped in lavender Italian foil, on top of 8 inch stems with silk leaves. I chose the lavender roses simply because it's my favorite color. You can also choose from several other pretty colors as well. These are perfect for that special lady in your life. I would have loved to have these as my wedding favors! Everyone loves kisses, right? Give the love of your life a bag full of colorful kisses and show them just how much they mean to you! 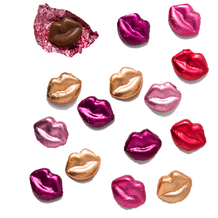 The multicolor mini lips are solid premium milk chocolate lips, wrapped in exquisite lipstick colored Italian foils. They are bright, bold and beautiful. The colors are shiny and perfect for Valentine's Day, wedding day or anniversary. Get your unique discount code to save 20% off your next Jockey order! Jockey sports bras have moisture wicking technology to keep you dry and your body cool while you workout. Be sure to stop by and enter to win my Purex & Jockey Prize Pack Giveaway (ends 1/27)! Use CODE: MUG2 at checkout. Be sure to order by February 5th for Valentine's Day delivery. For as long as I can remember I've always wanted a decorative arbor at the head of the walkway to our house. I think they are beautiful and add a decorative touch and pretty curb appeal. Sadly, after living in our current home for 12 years, I still haven't purchased an arbor, maybe this will be the year that I finally get one. The thing I love most about them is that you can purchase arbors of every size, finish, style, color and material. You can choose vinyl arbors to match the color of your home, wooden arbors to add that natural look and even garden arbors to create that magical garden space. 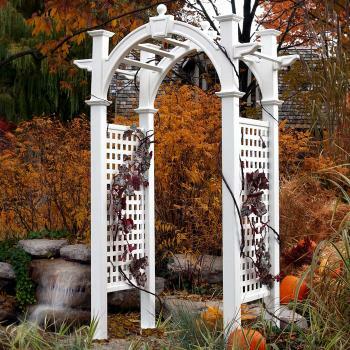 Arbors can make an ordinary space into something extraordinary! Arbors aren't only for your home or garden, they are also perfect for outdoor weddings and photo shoots. There is something about them that makes them beautiful, stylish and versatile. 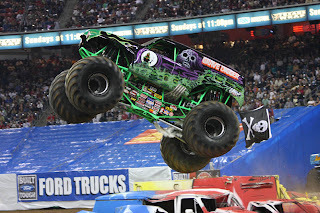 Monster Jam - Spokane Arena Giveaway - 5 Lucky Winners! Monster Jam is coming to the Spokane Arena and my kids are super excited! There is just something about BIG, loud trucks that is both a little exciting and a little scary. My kids love how it makes their entire body shake because of the noise! 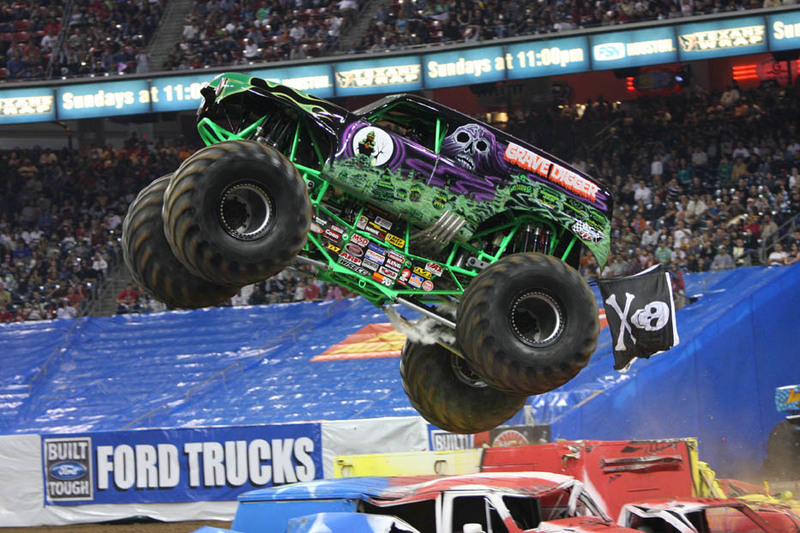 Your Local Ford Stores present the Advance Auto Parts Monster Jam at the Spokane Arena, February 17 - 19! USHRA Monster Trucks including Grave Digger driven by Carl Van Horn, Tasmanian Devil driven by Nicole Johnson, Iron Man driven by Scott Buetow, Monster Mutt Rottweiler driven by Charles Benns, Captain USA driven by Jeff Bainter, and Incinerator driven by Ryan Rice! $5 Adult Discount Coupons available at Your Local Ford Stores from 1/30/12 through 2/19/12 while supplies last! Is 2012 the year that you will get your debt and credit score back on track? It might not seem like much, but your credit score affects so many different things like buying a car or a house. Get your FREE Credit Score and profile today. You can view total loans, debt, payments as well as your debt-to-income ratio. It helps you find the best mortgage/refinance rates. The best part about this is these are rates you actually should qualify for since it bases it off the credit info. No wasting time on forms just to see if you qualify. You can also use it to check out loan and credit card options with "optimize". This will help you towards a goal of being debt free. Best part it is you can adjust your goals and profile to give you the best chance of succeeding. Valentines Day is right around the corner and it's time to start thinking about cards, chocolates and flowers. I know that my daughter is very excited about handing out Valentine's Day cards to her friends and classmates at school. Right now you can take advantage of a great Vistaprint offer and get 10 Free Note Cards perfect for Valentines Day. Cut them into 3’s to Make 30 FREE Personalized Kid’s Valentines! Add a personal message and even a photo to create a unique valentine for your child to hand out in class. Order now and enjoy a stress free Valentine’s Day this year! The Note Cards are free - just pay shipping and processing! HURRY! This Valentine's Day freebie is only valid through Friday the 27th! This is a Sponsored post written by me on behalf of Cellitused, Inc. for SocialSpark. All opinions are 100% mine. As much as I hate to admit it, I have no idea what I would do without my cell phone. When I was a kid we didn't have cell phones, computers and laptops - my parents didn't even have them. Now, it seems that just about everyone has a cell phone, young children included. As a busy mom of two young children, I find comfort in knowing that I can be contacted throughout the day no matter where I am. Technology is changing and improving on a daily basis. An electronic gadget that is the latest and greatest today will quickly become obsolete and there will be a newer and more powerful model on the market. You might be in the market to Sell Your iPhone and you might as well get some money for it in the process. Did you know that many mobile phones are manufactured with harmful and hazardous chemicals that can harm the environment? Cellitused.com provides you with the opportunity to recycle and sell your old cell phones and electronic devices while making a green choice for the environment.